Giles Carwyn and Todd Fahnestock are high school buddies who decided to collaborate on their first fantasy epic (don’t worry — high school was 20 years ago). Here’s their website. The Heartstone Trilogy — (2006-2008) Publisher: A young man forced into a fight for survival… A concubine sorceress seduced into the ultimate test of will… An enigmatic spy in love with a forbidden queen… And a reawakened evil that could remake the world. Introducing a major new talent, this riveting fantasy debut brings alive a richly imagined tale of brutal combat, sexual intrigue, and sinister magic in a world where one must always struggle to survive. A bastion of freedom and justice in a brutal world, the city-state of Ohndarien is ruled by the Children of the Seasons, four brave men and women tested before the awesome Heartstone and sworn to place the needs of others before their own. When Brophy, the Heir of Autumn, is falsely accused of murder, the city-state falls to treachery and deceit. Exiled to an enemy kingdom, Brophy’s only chance for survival lies in the deadly gladiatorial game of Nine Squares and the uncertain favors of its beautiful queen. Meanwhile, enslaved by the brutal perfidy of her master, the young courtesan Shara must face her deepest fears and darkest desires if she is to free herself from the web of foul sorcery that ensnares her magic and her very soul. But as Ohndarien fights for justice, evil powers, lost for centuries, wake in the wilderness, and an ancient terror walks the world again. 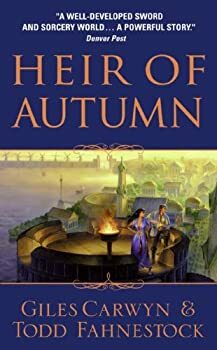 I started Heir of Autumn with skepticism because (1) it's a first novel (2) by two guys who've been friends since high school (3) that begins with a nubile young woman fondling herself as part of her sorcerous training. A few times during the first few chapters, I considered returning it to the library and writing it off as another botched heroic fantasy epic.